Musical instruments from any wood you wish, in a completed or partly-finished form for you to make. Bodies for lyra - lute - mandolin - bouzouki - tzouras - baglama etc. 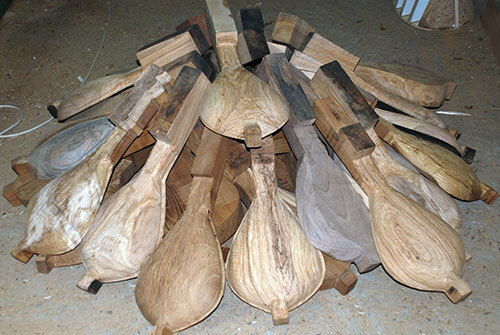 Strips for the construction of the body in a bouzouki, lute, tzoura from mulberry wood οlive tree wood, walnut wood, rosewood, maple wood, rosebush and ebony. Molds for all the aforementioned instruments and the possibility to make any mold or body you wish. Fingerboards from ebony- rosewood- wenge, carved with precision engineering for the maximum result and the best performance of the instrument. Soundboards from Lebanon Cedar (finiki or katrani as it is called in Crete) for all instruments. For lifelong durability we use carbon fibers for the neck. Be sure that the musical instrument that you will make or buy from us will never warp. Carbon (fiber) is a guaranteed and extra light material, used in Formula 1, shipbuilding, aviation and generally in constructions that have to be very robust but lightweight. We have ready to use necks for 3-string bouzouki, 4-string lute, tzouras with built-in carbon fiber rod. 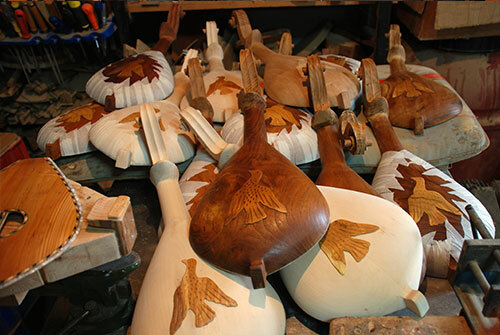 For embellishment: wooden figures and sound holes from olive tree wood for bouzouki and also timber, if you want to make them by yourselves. All our products are accompanied by a warranty and our advice for a sweet-voiced musical instrument of extremely high quality.